Colombo Thursday June 14, 2018: In a strategic move to reposition the entity to represent the Group’s business vision and take on the dynamic, technocentric business world of tomorrow, Taprobane Group announced the transformation of the Group including the name change to Ambeon. 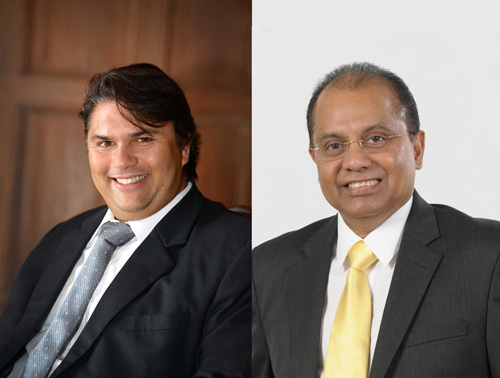 As such, Taprobane Holdings PLC will be repositioned as Ambeon Capital PLC while Lanka Century Investments PLC will be Ambeon Holdings PLC with immediate effect. The transformation of the Ambeon Group, which includes restructuring of its diversified businesses to bring about collective focus, optimize investments and increase shareholder value, is now said to be well poised to take the leap and transform latent opportunities into lucrative ventures that deliver sustained value. With over 3500 employees, the Ambeon Group is reputed for its market dominance in the areas of financial services, manufacturing, real estate, technology and strategic investments. Post-restructuring of the Group, Ambeon Capital PLC will be the Holding company while all businesses have been repositioned and realigned legally under Ambeon Holdings PLC, transforming the group to become a medium sized, diversified conglomerate geared to take on the business opportunities available in global markets. “Today’s announcement about the launch of Ambeon and the transformation of the Group is yet another milestone in our journey to build on our foundation of re-engineering success” stated Mr Sanjeev Gardiner, Chairman – Ambeon Capital PLC. “Ambeon Group is now ready and well poised to compete amongst the elite conglomerates in the country. As a dynamic and diversified Group of Companies, Ambeon will continue to seek for lucrative business opportunities and transform entities to be the best within their respective industries in Sri Lanka and the world. This is just the beginning. True to our commitment, we will continue our journey to enhance the overall wealth and value creation of our shareholders and all other stakeholders beyond ambition,” Gardiner concluded. Under the new Group structure, the subsidiaries of Ambeon Holdings PLC will include Taprobane Capital Plus (Pvt.) Ltd. (a leading financial services provider with a wealth of experience in capital markets in Sri Lanka), South Asia Textiles Industries Lanka (Pvt.) Ltd., (a leading manufacturer of exceptional quality weft knitted fabric specializing in knitting, dyeing, finishing, printing, brushing, sueding and anti-pin micro/polar fleece fabric for leading global brands such as Victoria Secret, Next, Marks & Spencer, Tesco, Calvin Klein, Decathlon and Adidas), Dankotuwa Porcelain PLC and Royal Fernwood Porcelain Ltd., (manufacturers of porcelain tableware and gift items for global giants such as Oneida, Macy’s, Country Road, Lenox, John Lewis, Crate & Barrel, Megros, Jasanmal, Ralph Lauren, the Walt Disney Company and Dilmah), Ceylon Leather Products PLC (manufacturer of leather footwear and accessories, popularly known as DI), Millennium Information Technologies (Pvt) Ltd (Sri Lanka’s leading information systems solutions providers delivering IT solutions for many industries; including banks and finance, telecommunications, apparel and leading conglomerates) and Colombo City Holdings PLC (real estate). Commenting on the transformation, Mr. Murali Prakash – Group Managing Director/ Chief Executive Officer – Ambeon Capital PLC and Ambeon Holdings PLC stated that, “It is with a sense of pride that I announce the birth of Ambeon – a well-diversified group of companies, empowered and backed by the market dominance, infinite potential and financial strengths of Taprobane Holdings PLC and Lanka Century Investments PLC. The Group has been restructured and realigned to be astute, driven, nimble and visionary – one with an expanded range of products, strong globalized local brands, premier technology and innovation platforms along with the required resources will pave the way for Ambeon to extend its footprint across new businesses, markets and regions”. “The Ambeon Group is built on a robust set of values which include identifying latent opportunities and moving first with the utmost discipline, empowering our people and channeling teamwork across all disciplines, building a culture of actioning results across all our businesses and seeing beyond the horizon in search of the next frontier. Integrity, governance, risk and compliance is further built into our DNA. This ensures that the Group maintains transparency across all processes, invariably benefitting our customers and creating sustainable long-term value for our shareholders and all other stakeholders. We are now future ready to re-engineer success across all our businesses,” Prakash concluded. The Ambeon Group is powered and guided by the renowned corporate giants – the Galle Face Hotel Group, the Hirdaramani Group and Navitas Holdings. The Group is managed by top corporate personality and renowned Industry veteran Murali Prakash as its Group Managing Director/Chief Executive Officer. The Ambeon Capital PLC Board of Directors comprise of eminent personalities – Sanjeev Gardiner (Chairman/Non-Independent Non-Executive Director), Ajith Devasurendra (Deputy Chairman/ Non-Independent, Non-Executive Director), Murali Prakash (Group Managing Director/ Chief Executive Officer), Priyantha Fernando (Independent Non-Executive Director), Harsha Amarasekera P.C (Non-Independent Non-Executive Director), Ranil Pathirana (Non-Independent Non-Executive Director), Sarinda Unamboowe (Independent Non-Executive Director), Desamanya Deva Rodrigo (Independent Non-Executive Director), while the Board of Directors of Ambeon Holdings PLC include – A.G. Weerasinghe (Chairman/Non-Independent Non-Executive Director), Murali Prakash (Group Managing Director/ Chief Executive Officer), Ruwan Sugathadasa (Non- Independent Non-Executive Director), Mangala Boyagoda (Independent Non-Executive Director), and Priyantha Maddumage (Non-Executive Director).